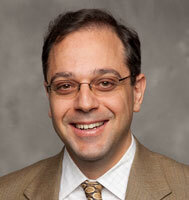 Dr. Anagnostopoulos is certified by the American Board of Thoracic Surgery and the American Board of Surgery. He completed two fellowships, one in cardiothoracic surgery at the University of Pittsburgh School of Medicine and a second in pediatric cardiac surgery at the University of California, San Francisco School of Medicine. He completed his general surgery residency at Henry Ford Hospital in Detroit. Dr. Anagnostopoulos received his MD from the University of Athens Medical School, Greece. His clinical interests include pediatric congenital heart surgery and minimally invasive heart surgery. Dr. Anagnostopoulos' research interests include coagulopathy associated with supraceliac aortic clamping and development of rapid deployment extracorporeal life support program.